↑ "N. Korean leader Kim dead: state TV". สืบค้นเมื่อ 19 December 2011. ↑ "Kim Jong Il Has Died". 18 December 2011. สืบค้นเมื่อ 19 December 2011. ↑ "Kim Jong-Il, Kim Il-Sung – In the Family Business – North Korea: Secrets and Lies – Photo Gallery". LIFE. สืบค้นเมื่อ 19 December 2011. ↑ 7.0 7.1 "BBC News - N Korean leader Kim Jong-il dies". Bbc.co.uk. สืบค้นเมื่อ 2011-12-19. ↑ McGivering, Jill (29 September 2009). "N Korea constitution bolsters Kim". BBC News. สืบค้นเมื่อ 7 May 2010. ↑ "NKorea prints photos of heir apparent Kim Jong Un". AP News. 30 September 2010. สืบค้นเมื่อ 30 September 2010. ↑ Steve Herrmann (9 October 2006). "Profile: Kim Jong-Il". BBC News. สืบค้นเมื่อ 17 December 2007. ↑ "Biography of the Dear Leader Kim Jong Il". Korea-dpr.com. Archived from the original on 12 June 2008. สืบค้นเมื่อ 5 December 2008. ↑ Kim Jong Il – Short Biography. Pyongyang: Foreign Languages Press, 1998, p. 1. ↑ Korea North General Secretary Kim Jong Il. USA International Business Publications. 2002. p. 37. ISBN 0739711970. ↑ "The Kims' North Korea", Asia Times, 4 June 2005. ↑ Kim Jong Il – Short Biography. Pyongyang: Foreign Languages Press, 1998, p. 4. ↑ Calleja, Stephen (7 February 2010). "1982 Labour government "secret" agreement with North Korea – 'Times change' – Alex Sceberras Trigona". The Malta Independent. สืบค้นเมื่อ 15 September 2010. ↑ "Kim is a baby rattling the sides of a cot", Guardian Unlimited, 30 December 2002. ↑ "Happy Birthday, Dear Leader – who's next in line? ", Asia Times, 14 February 2004. ↑ "North Korea's dear leader less dear", Fairfax Digital, 19 November 2004. ↑ "Testimony of Hwang Jang-yop". ↑ "North Korea: Nuclear Standoff", The Online NewsHour, PBS, 19 October 2006. ↑ "Fake ashes, very real North Korean sanctions", Asia Times Online, 16 December 2004. ↑ Noland, Marcus (2004). "Famine and Reform in North Korea". Asian Economic Papers. 3 (2): 1–40. doi:10.1162/1535351044193411?journalCode=asep. ↑ "North Korea: A terrible truth". The Economist. 17 April 1997. สืบค้นเมื่อ 24 September 2011. ↑ "North Korea Agriculture", Federal Research Division of the Library of Congress. Retrieved 11 March 2007. ↑ "Other Industry – North Korean Targets" Federation of American Scientists, 15 June 2000. ↑ "North Korea's Military Strategy", Parameters, U.S. Army War College Quarterly, 2003. ↑ "Kim Jong-il's military-first policy a silver bullet", Asia Times Online, 4 January 2007. ↑ "North Korea's Capitalist Experiment", Council on Foreign Relations, 8 June 2006. ↑ "On North Korea's streets, pink and tangerine buses", Christian Science Monitor, 2 June 2005. ↑ "Inside North Korea: A Joint U.S.-Chinese Dialogue", United States Institute of Peace, January 2007. ↑ 37.0 37.1 Chol-hwan Kang and Pierre Rigoulot (2005). The Aquariums of Pyongyang: Ten Years in the North Korean Gulag, Basic Books. ISBN 0-465-01104-7. ↑ "North Korea marks leader's birthday". BBC. 16 February 2002. สืบค้นเมื่อ 18 December 2007. ↑ "N.Korea leader sets world fashion trend: Pyongyang". FRANCE 24. 7 April 2010. สืบค้นเมื่อ 19 December 2011. ↑ Mansourov, Alexandre. ""Korean Monarch Kim Jong Il: Technocrat Ruler of the Hermit Kingdom Facing the Challenge of Modernity", The Nautilus Institute". Archived from the original on 16 August 2007. สืบค้นเมื่อ 18 December 2007. ↑ Scanlon, Charles (16 February 2007). "Nuclear deal fuels Kim's celebrations". BBC. สืบค้นเมื่อ 18 December 2007. ↑ Coonan, Clifford (21 October 2006). "Kim Jong Il, the tyrant with a passion for wine, women and the bomb". The Independent. London. สืบค้นเมื่อ 18 December 2007. ↑ Richard Lloyd Parry. "'Dear Leader' clings to power while his people pay the price", The Times. 10 October 2006. Retrieved 18 December 2007. ↑ "North Korea's 'Dear Leader' flaunts nuclear prowess". The New Zealand Herald. Reuters. 10 October 2006. สืบค้นเมื่อ 13 October 2011. ↑ Compiled by the Bureau of Democracy, Human Rights, and Labor. "Country Reports on Human Rights Practices" United States Department of State. 25 February 2004. Retrieved 18 December 2007. ↑ Jason LaBouyer "When friends become enemies — Understanding left-wing hostility to the DPRK" Lodestar. May/June 2005: pp. 7–9. Korea-DPR.com. Retrieved 18 December 2007. ↑ Marshall Cavendish Corporation (2007). World and Its Peoples: Eastern and Southern Asia. Marshall Cavendish. p. 929. ISBN 9780761476313. ↑ "Asan, KOLAND Permitted to Develop Kaesong Complex", The Korea Times, 23 April 2004. ↑ "S. Korea denies U.S. trade pact will exclude N. Korean industrial park", Yonhap News, 7 March 2007. ↑ "South Korea dials back tough talk over Cheonan sinking", Christian Science Monitor, 31 May 2010. ↑ "History of the 'Agreed Framework' and how it was broken", About: U.S. Gov Info/Resources, 12 March 2007. ↑ "Motivation Behind North Korea's Nuclear Confession", GLOCOM Platform, 28 October 2002. 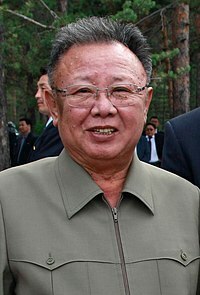 ↑ "N Korean leader Kim Jong-il dies". BBC News. 19 December 2011. สืบค้นเมื่อ 19 ธันวาคม พ.ศ. 2554. หน้านี้แก้ไขล่าสุดเมื่อวันที่ 7 กันยายน 2561 เวลา 14:47 น.